Cheltenham tips may seem somewhat out of character, from self-effacing jumps trainer, Nigel Twiston-Davies, but the trainer has told punters looking for advice on the forthcoming Betfred Gold Cup on March 15 to have a “few tenners” on his grand old timer, Imperial Commander. The horse ran such a tremendous race on his return from injury when narrowly defeated by Cape Tribulation in the Argento Chase in January, writes Elliot Slater. Sidelined since pulling up in the 2011 Cheltenham Gold Cup, (when he was the defending champion), many people had written off the 2010 blue riband winner, and he went into the Argento Chase officially rated 19lbs lower than his previous mark of 185. Although his handler had made it clear that the 12-year-old had only been back in full training for four weeks, the gelded son of Flemensfirth put up a stunning performance, racing enthusiastically and jumping superbly throughout as he took up the running at the 12th fence. With the Cheltenham crowd roaring him on, the hugely popular veteran went three lengths clear at the final fence and appeared to have the race in safe keeping. However, the lack of a previous outing and his extended period out of action caught up with him in the last 10 strides as Malcolm Jefferson’s admirable thorough stayer, Cape Tribulation, put in a power-packed finish to get up in the last couple of strides to score by a half-a-length. Looking beyond the initial disappointment of being caught close home in the Grade 2 contest, Twiston-Davies is now certain that he has the horse back very close to his best. He urged punters looking for a value bet in the Gold Cup not to overlook the former champion, who is now a top-priced 20/1 in the Cheltenham 2013 odds. 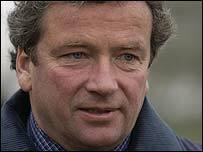 Fast forward 4 years to November 2017 and Nigel Twiston Davies has another likely Gold Cup contender in Ballyoptic. The horse won a Grade 1 hurdle at Aintree and a Grade 3 at Chepstow the previous season and now trying the bigger obstacles ran his rivals ragged to win a 3m class 2 Novice Chase at Exeter by 13 lengths. At the time of writing his next assignment on 18th November is at Cheltenham in the 3m½f (3m80y) (Old) mallardjewellers.com Novices' Chase (Class 2). He faces some stiff competition in Paul Nicholls' Black Corton and Harry Fry's Sir Ivan. 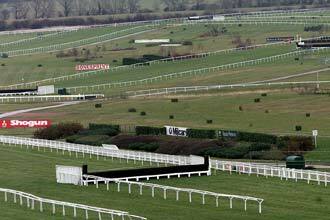 But if all goes well and Ballyoptic comes out on top the sky's the limit and Cheltenham glory beckons.